As the resident graphic designer/photographer at Tayco I get to work in and photograph office furniture that most people dream about. Ergonomically designed accessories, worksurfaces with enough space to hold all the stuff that sometimes piles up on us and workstations that you actually enjoy working in as opposed to dreadful cubicles. The showroom at Tayco has a section with a large window that allows for plenty of natural light to come through and illuminate most of the setup placed there. The only challenge faced while capturing this image was to get a neutral white balance that would render the color of the chair as close to white as possible. There was plenty of light coming through the window but it produced severe backlighting, so I had to introduce an artificial source to compensate. I placed an 18% grey card on the table, fired a frame for the reference WB and then took it off and captured the image you see* here. *After a few adjustments to Levels and Curves in Photoshop. 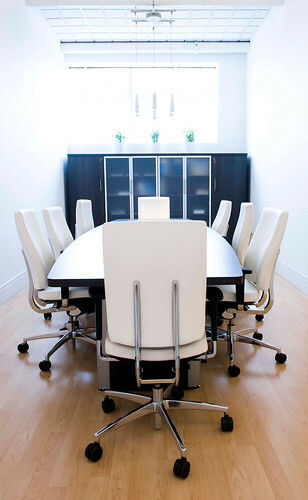 Nice blog… you can find more Executive Office Furniture that can be used at home or office. Productivity and creativity are clearly the by-products of the work environment you place yourself in each day. When your assets are intellectual property it is even more important that you invest in a office conference table that generates as much productivity and creativity as possible. Once I decided to purchase a modular conference table for our office the productivity of our employees has been on a very positive trajectory.